The Bathroom Building is directly west from the Electrical Control Building and flanks the entrance into the airport. It is similar in plan and architectural detailing to its neighbor to the east. Had the ornate Art Deco Entrance Gates as initially designed been constructed, the two buildings would have been fully integrated into the site. 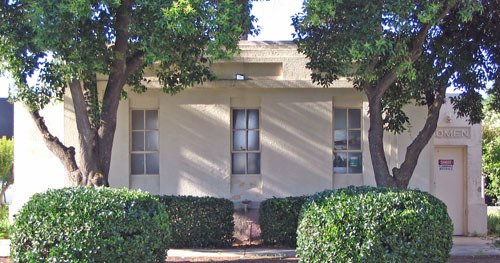 This building is rectangular in plan, with the exception of matching entrance vestibules on the west and east elevations. Three identical windows are on the north and south elevations and consist of four-light awning-style openings with two fixed panes below. The corners of the building are articulated with rectangular pilasters. The roof is flat with step backs at the coping.